We looked at issues such as attitudes to people with disabilities, stigma, inclusive education and training, leaving care, accommodation, supported living, accessibility, and employment and employers. Speakers came from Armenia, Ukraine, Georgia, Moldova, Uzbekistan, and Russia. The conference on 16 November gathered together a diverse group of speakers from NGOs, journalism and academia sharing experiences on disability and inclusion from Armenia, Ukraine, Georgia, Moldova, Uzbekistan and Russia, as well as from the UK. With the active participation of about 50 disability specialists, civil society representatives, students and members of the public in the audience, the conference explored a variety of issues related to disability and inclusion, such as attitudes towards people with disabilities, including widespread stigma; inclusive education and training; leaving care, accommodation and supported living; broader accessibility issues; and employment and employers. Following a welcome and introduction by The BEARR Trust’s new chairman, Nicola Ramsden, the first session provided a general overview of attitudes towards disability and inclusion from the perspective of parents, NGOs, governments and the general public in Russia and the UK. Anna Portugalova, Director of the NGO Downside Up in Moscow, which focuses on improving the lives of people with Down syndrome, highlighted challenges caused by the lack of data regarding the number of people with Down syndrome in Russia. The issue of unreliable and non-comparable statistics on disabilities was echoed in other sessions as being prevalent in many countries around Europe and globally, which makes it difficult to arrive at evidence-based policies. Many governments, including the Russian, are increasingly relying on data collected and approaches piloted by disability-focused NGOs. 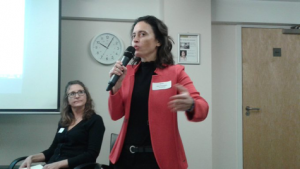 Anna raised another important issue – the lack of support for adults with disabilities regarding both care and education – which resonated strongly with speakers from other countries in Eastern Europe and Central Asia (EECA) and the audience from the UK. In an emotional and deeply personal presentation, Andrea Bennett, journalist, former BEARR Trustee and Chair of Trustees at the NGO For Us Too, and mother of a disabled person, emphasised the importance of taking into account the needs of parents, from delivering diagnosis to the time when children transition to adulthood. Andrea talked about the positive changes in perceptions towards disability since the 1970s in the UK. She also highlighted the many challenges that parents like herself currently face, including dealing with excessive bureaucracy when accessing social services. Significant cuts to welfare, school budgets and other public services over the past several years have decimated the services available to people with disabilities in many parts of the UK. The second session focused on disabled people leaving care and the challenges they face to find appropriate and accessible accommodation. Maia Shishniashvili, a founder of the NGO Hand in Hand from Georgia, described her challenging but rewarding journey to develop an effective approach to supported living for disabled adults, so called ‘community-based housing’. The advantages of a family-like environment, fostering independence of people with disabilities and their inclusion into local communities, are obvious – particularly in contrast to institutionalised accommodation. An inspiring video showed how acquiring a profession and finding a job completely changed the life of Tamara, one of the residents with disabilities. However, Maia also pointed out the financial difficulties her organisation faces in resourcing this approach with the government providing only half of the necessary funding. Dilmurad Yusupov, a doctoral researcher at the Institute for Development Studies at Sussex University and co-founder of the Uzbek NGO Sharoit Plus, shared the findings of his research on the potential for applying the principles of community-based inclusive development (CBID), a multi-sectoral, bottom-up approach to social inclusion of disabled people, in the traditional mahallasystem in Uzbekistan. Dilmurad raised the issue of the Soviet legacy of institutionalisation built on the functional model of disability based on the person’s ‘usefulness to society’ which is still prevalent in many post-Soviet countries. He also pointed out how the cultural and religious understanding of disability leads to stigma against people with disabilities in Uzbek society, particularly in rural areas. The session on inclusive education and training featured Tanya Buynovskaya, Director of Operations at the UK based charity HealthProm, who talked about one of the charity’s flagship projects, the Siberian Initiative for Inclusion. The project is supporting the inclusion of 1200 children with disabilities in the education system in 4 remote regions of Siberia through partnerships with local civil society, parents and local government. Tanya highlighted positive developments in the regulatory environment in Russia, particularly the 2017 federal law prohibiting discrimination against people with disabilities, and the increase in the number of students with disabilities in inclusive education. 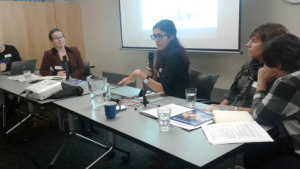 However, Tanya also talked about the many challenges in implementation leading to continued overreliance on institutionalisation and segregated education in the country. Viorica Cojocaru, a specialist at the Moldovan NGO CCF (Child, Community, Family) shared her experiences in running a programme for reintegrating a group of children with hearing impairments from a poorly-functioning residential institution into their biological families, foster/guardian homes and a family type children’s home. Viorica described the incredible progress the children achieved by being in a family environment and properly supported at inclusive mainstream and specialist schools equipped with functioning hearing aids, modern assistive technologies, musical instruments and educational materials for rehabilitation. Viorica also highlighted an issue that resonated in some other countries, namely the fact that hearing impediments are not identified early enough through screenings at birth and in early childhood, often due to a lack of specialists, particularly in remote regions. The final session focused on the employment of persons with disabilities, the role of employers and the importance of digital access. Iryna Los, Director of the Centre for Legal Assistance of the Open Doors NGO in Ukraine, drew several lessons from a project supported by BEARR which her organisation implemented in Nikopol. Good coordination and cooperation among all relevant stakeholders is vital. State employment and social services, employers, trade unions, educational institutions and also, crucially, disabled people themselves through their support organisations – all need to work closely together to overcome the numerous challenges facing disabled job seekers. Retraining to acquire professional skills that are in demand by employers, development of soft skills and mentoring are also very important as preparation for a successful transition from schooling to employment. Vardine Grigoryan, a Board Member of the NGO Disability-Inclusive Development in Armenia, shared her own story of searching for and eventually finding a job as a person with a disability. She also revealed the sobering 2018 statistics that only 8% of people with disabilities of working age are employed in Armenia: 92% are jobless or economically inactive. Vardine also pointed to a number of promising state programmes that could improve the situation, such as workplace adaptation for employees with disabilities, internships for young disabled people and financial support to entrepreneurs with disabilities. Closing on a positive note, Vardine also mentioned how the Armenian government is trying to incentivise employers by providing a range of assistive technologies free of charge and partial payment of the salaries of disabled employees. In several sessions the participants discussed the implications of the ratification – or lack of it – of the UN Convention on the Rights of Persons with Disabilities (UNCRPD) by different countries. While ratification in itself does not necessarily lead to incorporation into national legislation or effective implementation, the states’ obligation to report on implementation focuses the minds and resources of the authorities. Also, the opportunity for NGOs to provide ‘shadow’ reporting on implementation is a powerful took for activists to push for improvements. In her closing remarks, Nicola Ramsden followed the positive note and a constructive attitude of speakers in stating that, although many long-standing challenges remain and new challenges emerge in EECA, there are positive signs of progress in de-institutionalisation and growing collaboration between NGOs and other actors, including governments. Nicola also emphasised the need for increased outreach and spreading of best practice to ensure that disability inclusion gains in prominence and leads to further improvements in the lives of people with disabilities and their families as well as benefits to society at large. The BEARR Trust is very grateful to all the speakers, volunteers and other participants for their contributions to the success of the conference.